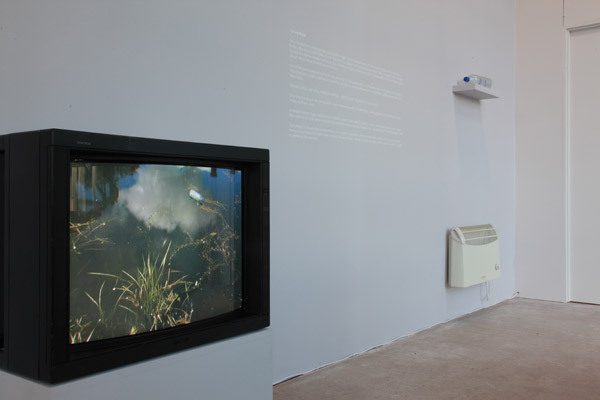 Two videos shown on monitors, Canal (2007) and Spring Water (2009), were made on the Leeds and Liverpool Canal in the Armley district of Leeds. In 2007, in conjunction with an exhibition at Leeds Art Gallery, Palmer made a sign-work in situ titled Botany Bay, which can still be seen on the canal about one kilometre from PSL. Through a static camera position, Canal presents this sign as a fluid reflection on the surface of the canal. At the time of filming Canal , a plastic bottle drifted in and out of the camera's view. Its chance appearance in the video provided the beginning of an idea for a subsequent work, Spring Water. In Australia, Palmer picked up several objects found on the seashore, just a few metres from the site of the first landing of British colonists at Botany Bay. One of these objects, a plastic bottle from Fiji, was brought to the UK by Palmer and later thrown into the canal, as a way of re-activating a link between Botany Bay, New South Wales and an eponymous section of the Leeds and Liverpool Canal.